Uh oh. To be completely honest, my first gut instinct was to reply in agreement, in which I did. As many of you are aware, I am a big advocate for Computer Science education. I will admit complete bias having completed CS in my undergrad. Having said that, is coding for everyone? NO. Do I hope to expose as many students to coding as possible? YES. I won’t reiterate what I have mentioned in the past with respect to computational thinking, creative play, etc. that coding can offer. You can Google the benefits of coding and read for yourself. @mraspinall @adchempages How can you know if you like it or not if you never try it? Perhaps coding is the new literacy – I keep seeing this statement a lot. @mraspinall @adchempages “Not everyone needs to learn math. They’ll never use it”. But it’s important as a different way of thinking. The notion of forcing every student to code seems counterproductive to the 21st century learning we keep preaching. After all, aren’t we about student choice and voice? Enforcement = compliance? So, back to my previous statement. Do I want to expose as many students as possible to coding? YES. Like Math, LA, the Arts, Phys. Ed., History, Geography, etc. coding is another way of viewing the world and thinking. Coding is another way to approach and solve rich problems and tasks. Coding offers students a safe place to take risks and fail as their code never runs as expected the first time through. Coding offers immediate feedback and allows the teacher to conference and co-learn alongside students and suggest links to other curricular areas. I want to see coding in elementary schools. I believe it is incredibly important for students to be exposed to it. I will continue to make noise about it. I will continue to share the cool projects we do in our classrooms. I often wonder if those who argue against coding are afraid to give it a try – or don’t quite understand it’s potential and benefits. So my challenge for you is simple. Try coding with your students – you don’t need to be an expert. Some students will like it, some will not. But the same can be said about every other subject taught in schools. Lastly, as I am writing this post I just noticed an article come across my twitter timeline. Not much to add. Every student should be exposed to coding and computer science. We are living in a society where students interact with technology at every turn. Education needs to keep up with that trend. Whether or not these students become computer programmers as adults is irrelevant. Having integrating coding into my math instruction, I can testify that it promotes skills such as computational thinking and growth mindset. One day, this blog will be outdated. That is to say, we do not question whether students need to learn word processing skills or spreadsheets. Why? 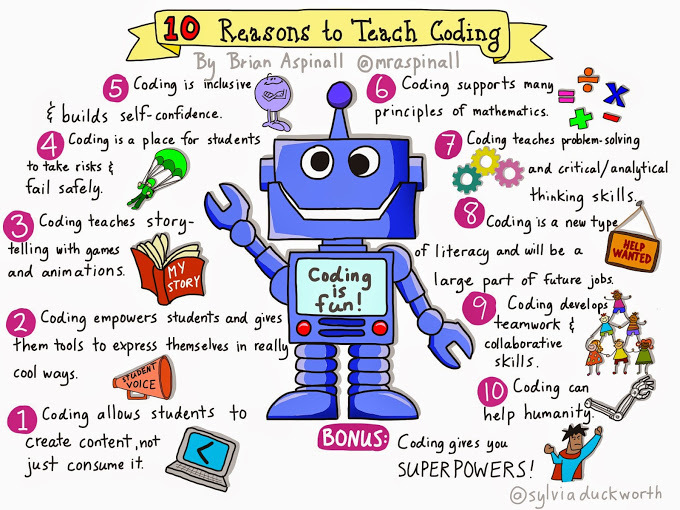 In my opinion, coding appears to be a larger learning curve for teachers. Many teachers do not have CS backgrounds. Yet I encourage teachers to see how easy it is to teach coding. When I learned coding as a high school student, I wish resources such as Scratch, Hopscotch or Khan Academy existed. Instead of questioning the need for coding, let’s make it available to as many students as possible. Exposure is key. Neither Brian, myself or any advocate of CS is trying to promote this skill or tool above all others. We just want it to be made available. Brian, I agree with so much of what you shared here. I wonder what would happen if we asked teachers why they don’t try coding. I bet that there are various reasons. For me, I was initially reluctant because I saw it as an add-on in the primary grades. I wanted to see those links to the curriculum expectations. When I could make these links, I offered the choice to code more often. I think of an email that I saw the other day about our Maker Day last year. It spoke about the success of last year’s event, but also what we could do to bring more making into everyday classroom learning. I think that there’s benefits of thinking like this for all “maker” options (including coding). Now I would also say that students need more than one experience to code before seeing if it’s right for them. For many students, they’ll need numerous opportunities to struggle and fail before meeting with success and/or deciding on other options. How do we provide enough of these open-ended opportunities, but also scaffold for students that are struggling? Thanks for giving me more to think about! We know each other well enough to know that I don’t take any issue with any of this (well, maybe the title) content. An oft hear remark is “where will I find the time” for this. I think that’s reflective of the mindset that “oh boy, here we go again – something new to add-on to an already crowded curriculum”. A couple of responses that come to mind immediately are 1) if it’s done right, it’s not an add-on, it’s just another way of teaching and 2) there are lots of things that could easily be dropped from the current curriculum. Until the concept of coding is formally adopted by the Ministry of Education as a curriculum piece as it has been in other jurisdictions, sadly, the concept will be well embraced in progressive classrooms and ignored by the majority. I thought the title was a little extreme – In all fairness I wanted to quote the tweet that sparked this conversation. Your blog puts the “everyone needs to code” movement into a much better perspective. So far, I’ve been mostly against it. On the surface, it seems like the most ridiculous concept in a complex society where we have specialization and division of labour. Trying to get “everyone” to learn the detailed skill set of one particular career seems like a giant waste of time. Like trying to get everyone in the country to learn how to perform a root canal. I like your angle of ‘exposing’ everyone to coding, not with a college-style career training model, but to help students see the world through the language of coding and introduce them to the methods by which so much of what they use is based on. If they play with it, explore with it and build with it, it will help them think differently. Coding can deepen their understanding of the complex world they live in, even though most of them will never have careers in coding. That part, is pretty fantastic. And I’ll agree that everyone should be exposed to coding. I’m a huge fan of Scratch and it’s been great to see the resurgence of old school LOGO type apps like TurtleArt. I’m in New Zealand and the Maker movement is taking off and our robotics is pretty strong. We can normally fit coding at the primary level as teachers have a lot of flexibility with the curriculum. We are starting to get more coding/computer science in teacher PD. For me, the benefits of coding are providing an experience for students that almost never works first time. Failure becomes normal which is great for problem solving. I’ve also found that the coding stars in the class are not always the top maths students, and sometimes the students who are quite poor at maths. What a great opportunity to provide another subject for students to shine in! There seems to be a good correlation between computer science and improved maths scores too.